Due to the apparent delay of our Roth IRA transfer process at Vanguard, I decided to mail the checks ($1000 each) to Scottrade for our forth quarter Roth IRA contributions. When I started the transfer process at the end of last month, I thought it could be done before the next quarterly automatic investment date at Vanguard, which I set at November 5th. Now it seems that the funds we currently hold at Scottrade won’t be ready at Vanguard by the 5th of next month. Meanwhile, the scheduled investment date we set with Scottrade is the 25th of this month. Though we have till next April to max out our 2006 IRA contributions, I like things to go as planed. Besides, Scottrade will keep calling me if the money isn’t in the accounts tomorrow. So instead of waiting for our accounts to get ready at Vanguard, I sent the checks to Scottrade last Saturday. I usually sent money Scottrade via my bank’s bill-pay well ahead of the investment date, but not this time. Luckily Scottrade has a branch office in our neighboring town, so the mail won’t take long to get there. If things go exceptionally fast and our accounts at Vanguard are ready before November 5th, I can always call and cancel the pending investment and let they start from next year. By the way, I followed Jonathan’s post and linked my checking account at Bank of America with Scottrade yesterday. 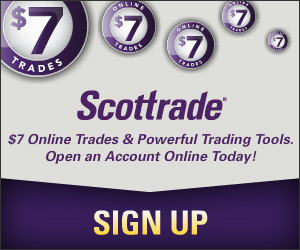 Scottrade used to have a eCheck function that allowed same day deposit. But that service was canceled when there was a security breach. Since then, the only fee-free means to send money to my account was by writing them a check which could take several days. Unless the stock purchase is planed, I guess nobody really wants to wait that long to buy stocks they want right away. Of course, you can always wire the money, but that addes additional costs to the purchase. Now with their ACH deposit service, money can be transferred from linked checking or savings account to the Scottrade account. Though it will also takes up to three days for the fund to be cleared (Firstrade also has this two-day waiting period for up to $5000 transfer), it’s better than mailing a check.